Before planting: thoroughly wet the roots by soaking in a bucket until bubbling stops. 1 Set tree out according to your plan, to get the right plant in the right place. 2. Dig a hole wider and deeper than the root ball (about twice as big)and loosen soil in the bottom of the hole to help roots to grow down. 3 Remove plant from the bag or container without pulling on the stem (slice the bag, or tip upside down and shake, holding onto the bottom of the bag and the soil around the stem). Plant garlic until the end of July. Plant each clove 10cm apart and 5cm deep. Winter cold makes broccoli, cabbage, carrots and pak choi sweeter! 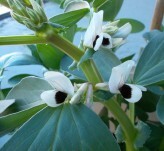 Pinch back the tips of your broad beans when the plants are a metre high, to make them bushy. Swap seeds with friends and family to save money and have a bigger variety to sow. In winter the soil is wet for weeks. Do not step on the soil when its wet because this squashes the air out. The soil will be hard when it dries. Light, fluffy, airy soil is best for growing vegetables. mulching. Spread a 15 cm layer of woodchippings or straw on top of the soil. Do not dig or mix it in. Mulch is like a blanket. Covering bare soil. Nutrients leak out of bare soil and all the tiny helpful bugs move away, too. If you are not growing anything in winter, sow a green crop of lupins, oats or mustard. Making paths through your vegetable plot. Use mulch to cover the paths so everyone knows where to walk. Do you have prickles in your lawn in summer? Now is the time of year to stop the prickle plant, Onehunga weed. This plant needs lots of light. Do not mow your lawn in July and August and let the grass shade the Onehunga weed. This kills the prickle plant. Easy!